Today I had a tour of the city of Dhaka. It was arranged and given by members of the project team, which was very generous of them! We started at the hotel at 9am, where a driver and two others (Touhed and Nipa) picked me up. First stop was the parliament buildings (Sangshad Bhaban), which were built in the early 1940’s and designed by an American architect. Very interesting design, as you will see by the photos! There are also residences for parliamentary staff nearby. We also went to a memorial for one of Bangladesh’s Prime Ministers. Following that we went to the campus of Dhaka University, which is a large university well-known throughout Asia. There we saw many faculty buildings, passed by student residences and faculty residences. There is also a memorial to the people who died fighting in the language movement (Shahid Minar), trying to save the Bengali language, and an interesting statue depicting various famous people from Bangladesh (such as Ravi Shankar). The university campus was quite nice, with wide streets and not that crowded with people, but that could have been because Friday and Saturday are the weekend, and today is Friday. In fact, we didn’t get stuck in too many traffic jams! We also wandered a bit through a road-side market which sold many things made from pottery and a lot of bags. The next stop was the Lalbagh Fort. Construction began on the fort in 1678, but was later abandoned. 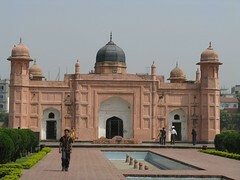 The fort was surrounded by a wall, and inside there were a few buildings, including a mosque. From the top of the wall we were able to see into some of the city streets, which were packed with people and rickshaws going about their Friday business. For many people, Friday is the only day they get off all week. There was also a lovely odour of rotting garbage wafting up from some garbage bins. In the fort there was a small museum, which had coins, weapons, an example of soldier dress, dishes and several carpets. I don’t think much archeological excavation has occurred in the area, as the museum was pretty sparse! Following that, we went to the Sadarghat Riverport. It is a big port on the Buriganga River, a badly polluted waterway used for transportation. There were many little boats carrying one or two passengers from one side to the other. 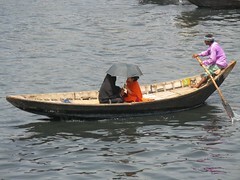 There were also many large boats which transport people up the river to their communities. These leave at night, but this morning there were already some people on the boats staking a claim to their space. There are no seats, just big empty decks. We went in one to get a view of the port. There were also many boats carrying goods and produce. It was very interesting! I can’t say it smelled very good though. It really is amazing how bad a state the environment is here. The most interesting part of the tour for me was the trip into the Old City. 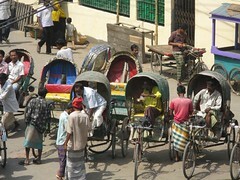 In this part of the city, the streets are very narrow, and the only vehicles that can pass through are rickshaws. I also rode in one! These and the auto-rickshaws seem to be a major mode of transportation for most people. Anyways, the streets were packed with people. In this area, the majority of the people are Hindus. There was so much going on in such a small space! 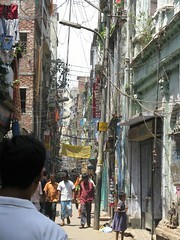 I don’t think I managed to take it all in as we walked along the narrow rode and tried not to be run over by rickshaws. In this part of the city, more than any other I’ve been in yet, the population density in this country (1,000+/square kilometer, and much higher in the city) could be felt. Along the way we also stopped at the tombs of three political leaders who fought for independence from British India, and the Supreme Court, which was formerly the British Governor’s Residence. On the journey we passed several trucks that were parked with line-ups of people waiting behind them. They were waiting to buy rice at a subsidized price from the government. The price of rice has increased by 60% over the last 6 months, and is a staple in most peoeple’s diets. Women often have to wait in line for 6 hours. In addition to the world-wide problem of increasing food prices, Bangladesh is still suffering the effects from Cyclone Sidr and widespread flooding. Bangladesh is a very low-lying country, as it is located in the Ganges-Brahmaputra River Delta. Most of the country is 10m above sea-level. Deforestation is also having an effect, decreasing the land’s capacity to hold water. We also passed by sidewalk barbers – a chair and a mirror on the sidewalk, women collecting water from communal water points, and several markets which looked interesting – full of food and textiles and other products. For my next adventure – making my way to brunch tomorrow with Emmanuelle’s friend Robin. Wish me luck! Following that, Monday the 14th is Bengali New Year, and I am going to be attending some of the festivities with some of the people from the office! Submitted by Meg on Fri, 2008-04-11 23:49. Thanks Kev! I hope I get a few more chances to see some more parts of this huge city. Submitted by kevin@haggaret.com on Fri, 2008-04-11 14:13. Great post Meg. Since I'll likely never get a chance to visit these places that you travel to for work, I'm really enjoying reading about your days off and the sights and sounds you are experiencing. The photos are great too!